Even my husband loved this – which is super difficult. He has already requested it again in a few weeks! Great recipe. Thanks! I actual drain mine for a moment on paper towels then transfer to my warmed toaster oven to keep them from getting soggy. This was definitely the best meal I ever made, and my husband agrees! So juicy and delicious! I didn't even know that cooking creme existed! I'm a beginner cook, so this one stretched my skill level, but mostly because I was trying to make everything come out at the same time, which I succeeded! I made the parmasan knots as a side bread, which is a recipe I also found on pinterest. Found this on Pinterest. Made it tonight for dinner and the entire family loved it! Thanks for the great recipe! I Found this recipe on Pinterest. I'm a pretty picky eater and this looked Great! I made it for dinner tonight and I will definitely be making it again! I did do some things a little different. I only added 1 can of cream of chicken soup as it was all I had in the pantry, and I baked the chicken instead of frying it. It turned out great! Thanks for the step by step instructions! 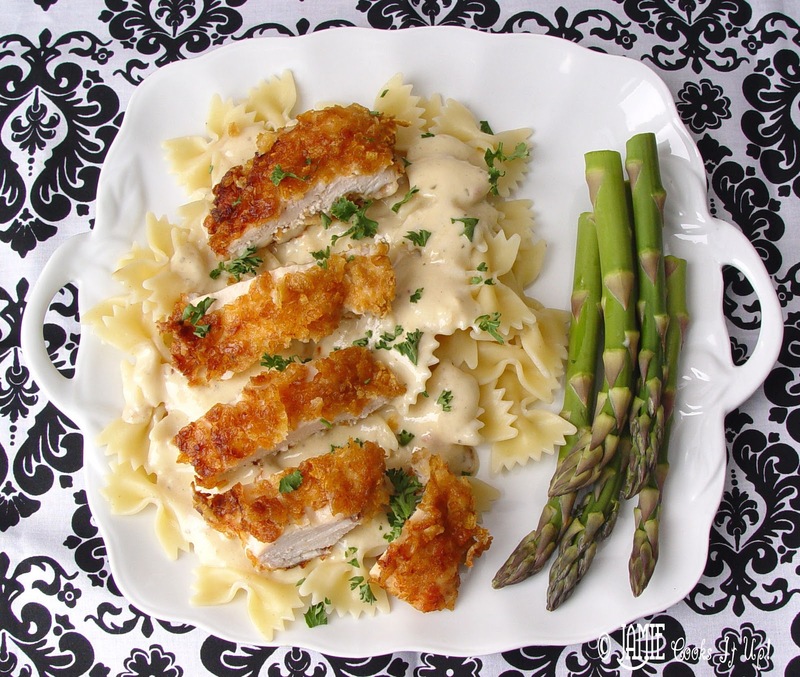 Can you use chicken tenderloins instead of chicken breasts? You can use chicken tenders, just watch them close while they are cooking so they don't burn. Good luck! Hope you enjoy it! I made this recipe a few weeks ago and it was delicious. 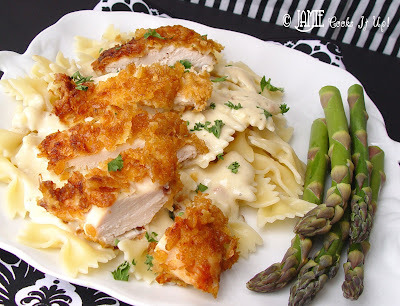 I want to make it again but instead of frying the chicken I want to bake it to make it less fattening. Any suggestions? You can indeed bake chicken. Cover it loosely with tin foil and bake it for about 45 minutes. Take the foil off, bake for 15 more minutes, or until the inside of the chicken is no longer pink. Good luck! – Insane girl! Could your photography get any more drmeay? Nope I don’t think it’s possible. This image is the dreamiest! Love all of your work. I made this except I used breadcrumbs cause I didn't have cornflakes. The chicken was still good. The sauce is a lot I only used half of it on my pasta. It was so good though. I love the flavor. Great recipe. Thank you. Your recipes are amazing! I have tried several! I had to use corn chex with this as I thought I had cornflakes and didn't. It was still good with it that way! LOVE your blog, your recipes, your entries included with the recipes!! Fantastic! Thank you! Delish!!! Made for dinner tonight and everyone was licking their plate! Thank you!!! Wonderful!!!! It made a ton of sauce! My picky 7 year old said she loved it! Will definitely make again. My hubby tasted it and literally asked me to marry him again! Lol! My four year old downed his bowl of it as well. Definitely adding to our menu rotation! This is a fatty fat recipe if I ever did see! Sorry, but I doubt any of you need to be eating this junk. Love this recipe. and to the above poster, i figured out the calories for this, i used skim milk and less oil than called for, and my meal was just a little over 600 calories, and not incredibly fatty at all. I will be making this again! Delicious creamy sauce, but I used Philadelphia Garlic Cooking cream instead of cream cheese and garlic. Makes a TON of food, will probably half the pasta recipe next time, but will definitely make again! Tried this tonight. Soooooo good! Hi! I found this on pinterest! It was super yummy! I had a ton of sauce left! Could I possibly freeze the sauce? Thanks! Hello! I also found this on Pinterest, and just made it…..it was a huge hit! Thank you!! LOVED! Even though I made the smoke alarms go off, with guests in the house, while frying the chicken. It was still a huge success! 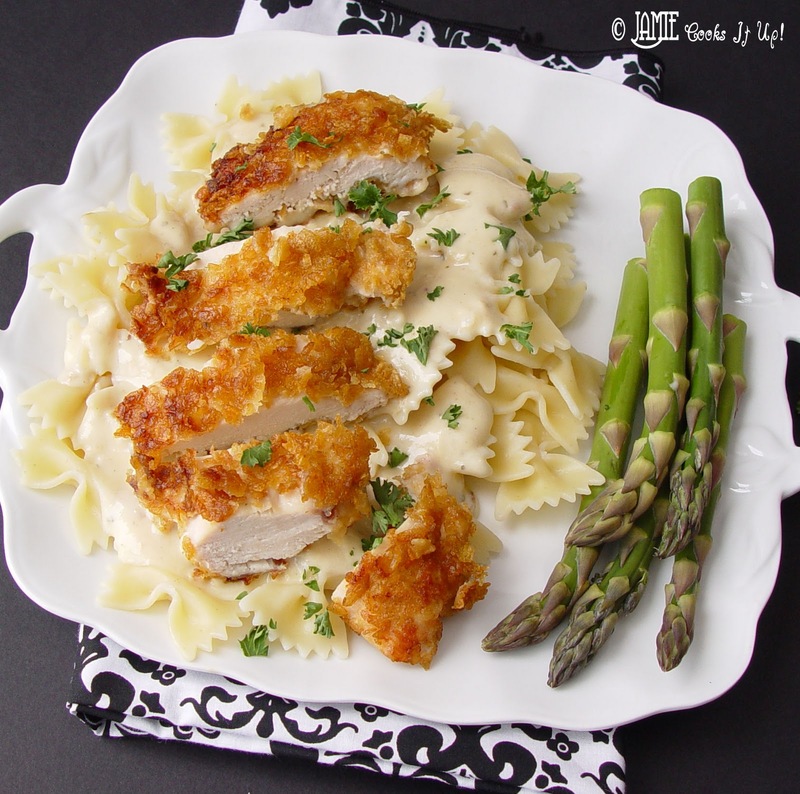 My hubby and I tried the sauce recipie the other night and loved it! So good 🙂 Thank you for posting. I wanted to try the chicken, but we didn’t have cornflakes so I made my usual parmesan chicken instead. Definitely recommend it 🙂 but I will have to try your chicken recipie next time for sure! I made this for dinner tonight and the entire family loved it! Will make again! What temperature would you suggest baking this? 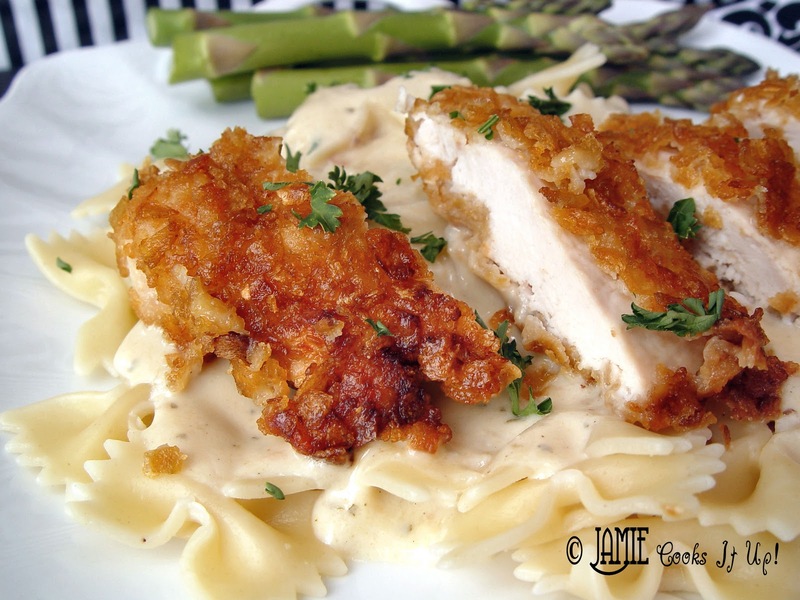 Great recipe … Made tonight for the family … Super easy and very flavor full. Everyone said it was a keeper recipe. Made a ton of sauce … I’d probably 1/2 the sauce part next time. This was so good! Loved it~! The sauce was really, really good. I’d definitely make this again. Hi! Just made this and have tons of sauce leftover. Can it be frozen touse agin next time I make this? Since this sauce has a cream base it doesn’t freeze very well. I made this tonight and it was fantastic!!! I substituted French fried onions for half of the corn flakes and yummy! Plenty of leftovers to go to work tomorrow, too! Made this and it turned out great! Only used one can of the cream of chicken soup for the sauce and still had quite a bit left over. Ended up freezing the remainder of the sauce to use for when I make it next time! Found this on Pinterest and it was WONDERFUL! I’ve never breaded with corn flakes and that combined with the sauce was absolutely incredible. The second time I made it I realized I didn’t have the Philly cooking creme so I searched for a recipe to make my own. The actual recipe I found called for 2 tsp Italian seasoning mixed with 5 ounces of softened cream cheese. It was a little too much seasoning but still good. Next time I’ll use half the seasoning. Hi! I want to make this dish for my parents anniversary but I want to know exactly how many people this feeds so I don’t end up with too many leftovers. My whole family, that’s 6 of us, loved this!! !not too hard to make and REALLY yummy!!!! Thank you, this is going in our family recipes. So I’ve made this about 5 times in the last year and its always been a huge success… But lately I’ve been having a difficult time finding the cooking cream. Is there a substitution that I could use instead of the cooking cream? I’ve been to 4 grocery stores and it almost seems like everyone is discontinuing it…? I’m with Annie…I can’t seem to find the cooking cream any where! have they discontinued it and is there a substitution? Thank you so much! It looks like Kraft has discontinued the cooking cream, darn it. 🙂 I am working on a homemade substitute. When I read that someone thought they might be discontinuing it — I went to the store and bought ALL THEY HAD LEFT! They were on clearance. I froze them. Hopefully they’ll last until you can be super creative to help me do otherwise! Jamie, did you come up with a homemade recipe?! I’m so sad about this being discontinued!! I did come up with a substitution for the cooking creme months ago. For starters, I thought there was way too much sauce for the amount of chicken in the first place. I googled a homemade version and tweaked my overall recipe. I now use 3/4 (6 oz) of cream cheese and 2 tsp Italian seasoning in its place. I also started making my own cream of chicken soup which is slightly thinner than the canned version. That balances out the much thicker homemade cooking cream. Wow, that sounds great! Thanks for sharing your tips with us!